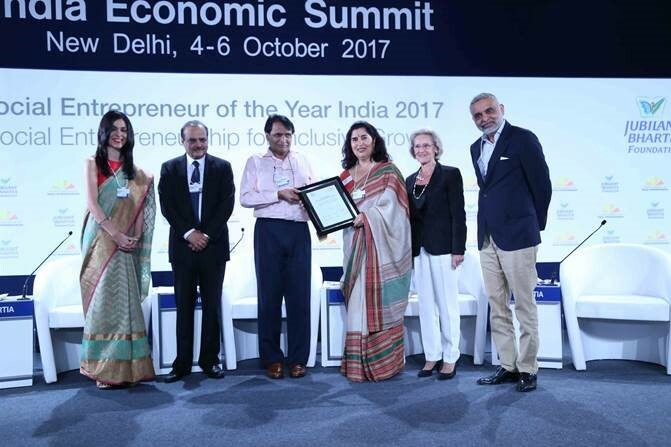 The Schwab Foundation for Social Entrepreneurship, a sister organization of the World Economic Forum, in partnership with the Jubilant Bhartia Foundation announced Urvashi Sahni of Study Hall Educational Foundation (SHEF) as the winner of the Social Entrepreneur of the Year India 2017 Award. Social entrepreneurs are the change agents who are addressing the needs of underserved communities in both scalable and sustainable ways. 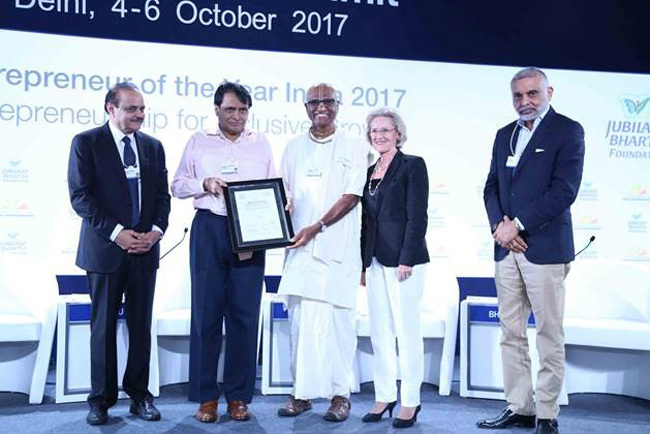 The winner of SEOY India 2017 Award was able to impress the eminent jury by scoring high on the parameters of Innovation, sustainability, Direct Social Impact, Reach & Scope and Replicability. The winner qualified as a candidate who is actively bringing social change by transforming traditional practice and is apt to be a role model for future social entrepreneurs and the general public. Urvashi Sahni of Study Hall Educational Foundation (SHEF) was awarded for her exceptional contribution in the field of education that includes, empowers and builds leaders among India’s most disadvantaged girls. Aided by technology, policy push and partnerships with the state governments of Rajasthan and Uttar Pradesh, SHEF has scaled its model of education to 900 government schools, trained 5000 government teachers and impacted 1,50,000 girls directly and 2,70,000 girls indirectly in the hotbeds of poverty and gender discrimination. Schwab Foundation and Jubilant Bhartia Foundation warmly congratulate the finalists and for their outstanding contributions. 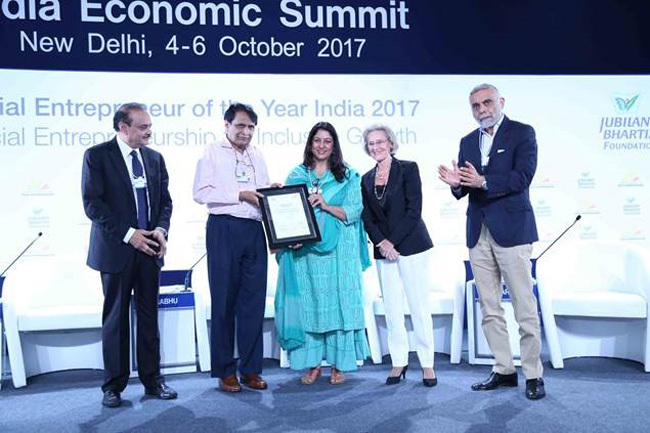 This year’s SEOY India Award winner, Urvashi Sahni of Study Hall Educational Foundation (SHEF) will be invited to join the Schwab Foundation’s global community of over 300 social innovators. Madhu Pandit Dasa of The Akshaya Patra Foundation, founded it in 2000, with a mission that “no child in India should be deprived of education because of hunger”, Akshaya Patra (Sanskrit for ‘inexhaustible vessel’) provides nutritious, and hygienic meals to children in government schools through India’s ambitious mid-day meal scheme (MDM). In less than a deca de, it has established itself as the world’s largest MDM provider – feeding 1.6 million children a day across 12 states. To deliver meals on time with the highest quality of hygiene, nutrition and culinary preferences across urban geographies, Akshay Patra has designed kitchen that operate on the backbone of technology to produce 100,000 meals per day, with minimum human handling. 13 out of AP’s 26 urban kitchens are ISO 22000:2005 certified for excellence in Food Safety Management System (FSMS). Improvement strategies like Kaizen, Continual Improvement Projects and Six Sigma are constantly being implemented in APs’ kitchens to ensure food safety, efficiency and cost reduction. For its founder Madhu Pandit Dasa, every child in school is a child free from labour. Under his leadership AP has scaled rapidly, setting an ambitious target to feed 5 million children by 2020. Safeena Husain and her venture, Educate Girls are working indefatigably to address the gender inequality in education. At the heart of EG’s model is a highly motivated, mission driven cadre of 10,000 volunteers called ‘Team Balika’. Drawn from the village community, they are local role models, going door-to-door to identify out of school girls and convincing parents through multiple strategies to send them to school. Tackling the issue of poor infrastructure, they work with School Management Committees to prepare school improvement plans, including building toilets for girls. Trained by EG to deliver its creative learning and life skills kits, they promote girls leadership through lifeskills training. From a pilot project in Pali and Jalore districts in Rajasthan, EG has grown in ten years into a 16000+ schools program, with over 1,50,000 girls enrolled in school till date (with 90% retention), and reaching over 3.8 million total beneficiaries. Safeena is also piloting the Development Impact Bond – an innovation that has the power to transform how government, business and civil society invest in the long-term to ensure that no girl is out of school in India. 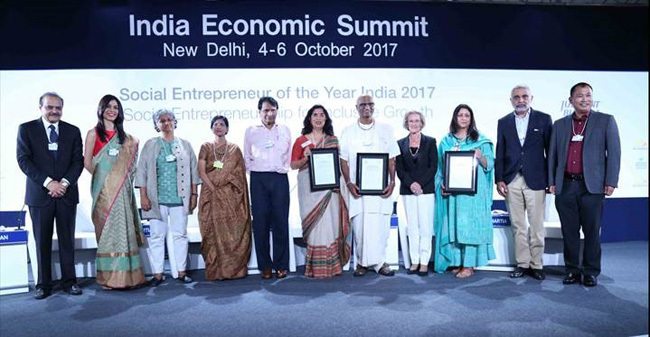 Of over 100 applicants received for this year’s Social Entrepreneur of the Year selection process for India, three finalists emerged after several stages of rigorous assessment. An independent panel of distinguished jury selected the winner. This year’s jury members included Ms Hilde Schwab, Chairperson & Co founder, Schwab Foundation for Social Entrepreneurship; Ms Shobhana Bhartia, Chairperson & Editorial Director, HT Media Ltd; Ms Sudha Pillai, Board Member, Jubilant Life Sciences Ltd & Former Member Secretary, Planning Commission, Government of India; Mr Amitabh Kant, CEO, NITI Aayog, Government of India; Mr Sunil Kant Munjal, Chairman, Hero Enterprise; Mr Paul Basil, Founder & CEO, Villgro Innovation Foundation; Mr Neichute Doulo, Founder, Entrepreneur Associates & Winner SEOY 2016 and Ms Neelam Chhiber, Founder, Industree Crafts Foundation & Winner SEOY 2011. The SEOY Awards have been in existence in India for 13 years now. 2017 celebrates eighth year of partnership between the Schwab Foundation for Social Entrepreneurship and the Jubilant Bhartia Foundation.